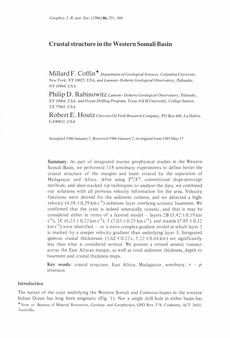 As part of integrated marine geophysical studies in the Western Somali Basin, we performed 118 sonobuoy experiments to define better the crustal structure of the margins and basin created by the separation of Madagascar and Africa. After using T2/X2, conventional slope-intercept methods, and slant-stacked t-p techniques to analyse the data, we combined our solutions with all previous velocity information for the area. Velocity functions were derived for the sediment coiumn, and we detected a high-velocity (4.58 ± 0.29 km s–1) sediment layer overlying acoustic basement. We confirmed that the crust is indeed seismically oceanic, and that it may be considered either in terms of a layered model – layers 2B (5.42 ± 0.19 km s–1), 2C (6.23 ± 0.22 km s–1), 3 (7.03 ± 0.25 km s–1), and mantle (7.85 ± 0.32 km s–1) were identified – or a more complex gradient model in which layer 2 is marked by a steeper velocity gradient than underlying layer 3. Integrated igneous crustal thicknesses (1.62 ± 0.22 s, 5.22 ± 0.64 km) are significantly less than what is considered normal. We present a revised seismic transect across the East African margin, as well as total sediment thickness, depth to basement and crustal thickness maps.